With a Stamp and a Song: OCL Blog Hop! Halloween is one of my favorite themes to stamp! It is because I absolutely adore these colors! I have so many great memories of my brothers and I trick-or-treating in our small-town neighborhood. My dad, a pharmacist (potions, haha! ), worked at a store that put on a big Halloween trunk party every year, complete with the headless horseman and a faux Dracula and lots of other harmless Halloween drama. So much fun! Little Boogas perfectly captures the spirit of those safely spooky Halloween nights! It's all innocent smiles and family-friendly costumes without any really scary stuff! For today's card I used a bit of Basic Grey Halloween paper left over from last year. I used my favorite concoctions of Memento ink, Copic markers, some Spica pen sparkle, nestabilities ovals, scalloped ovals and squares, some silky ribbon, a Martha Stewart border punch, and sparkly bling. Everything about it just makes me smile! I hope it makes you feel that way too! Have fun exploring the rest of our friends' and team members' projects for today's hop! Your choice of colors and that spider web border punch just sets it off. Too cute! LOVE IT DEB! lol..I could't wait to see this today and it's just FABULOUS! Love that border punch!! Perfect for the image. Great card, Deb!! Deb, that looks wonderful! Awesome Halloween card! Love your card! Too cute! This is too cute, Deb! And that punch is SO perfect with this set!! So so cute Deb. Your coloring is always so amazing. I LOVE the purple and green together! This is the cutest set. I love Halloween. It sounds like you had a great time as a kid with it. I love the web from the MS punch. Great card! CUTE card! 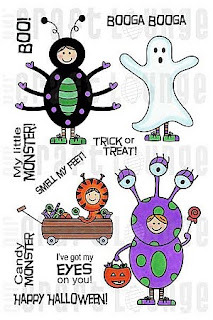 These Halloween guys are just soo CUTE!! This is such a cute stamp set! Love what you did with that cute card!! Always inspirational!! Thanks for sharing! This set is so fun! Reminds me of a blowup costume I had as a kid! Those are such cute monsters! I like how you used the web border. Very cute. The MS web punch goes perfectly with the card and the holiday. I gotta get this set! it is too cute. just got my new cosmo cricket dec paper today in the mail.. this would look so cute with it! So stinkin' cute Deb, love your design and coloring! This guy is adorable. I want to take him home! Super cute, Deb! LOL'ing about your Dad and "potions!" OH Deb! This is just too darn cute! And the web edging is great!! It was so wonderful to have seen you!! HUGS! What a fun card! Love the colors. So fun, Deb! Love the striking purple and black! Just a fun playful set. Love all the elements you used. Beautiful. 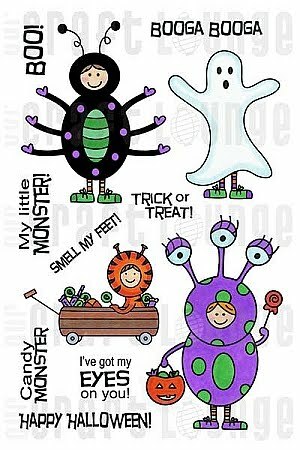 Cute little characters for Halloween. I love blog hops, I just sometimes have a hard time getting around to see everyone's projects!